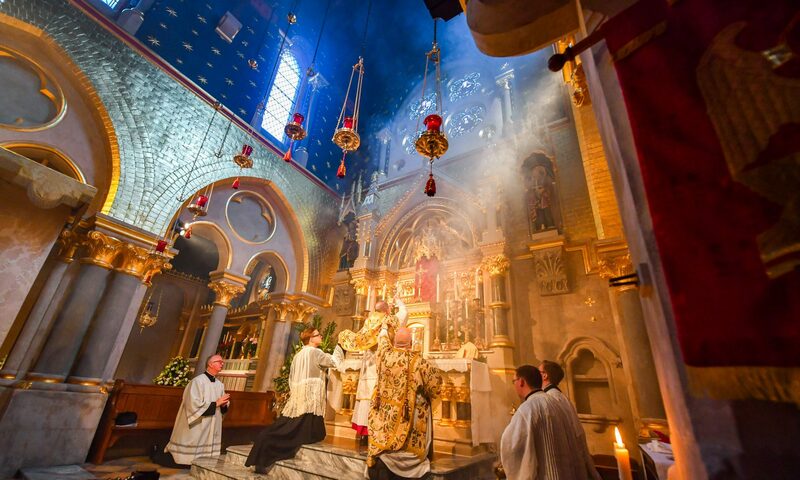 Corpus Christi is home to the London Shrine of Our Lady of Walsingham. The Shrine Chapel was redesigned as part of the restoration of the church under the parish priest, Fr. Alan Robinson, together with the architect, Anthony Delarue. The design is based on the Holy House of Loreto. 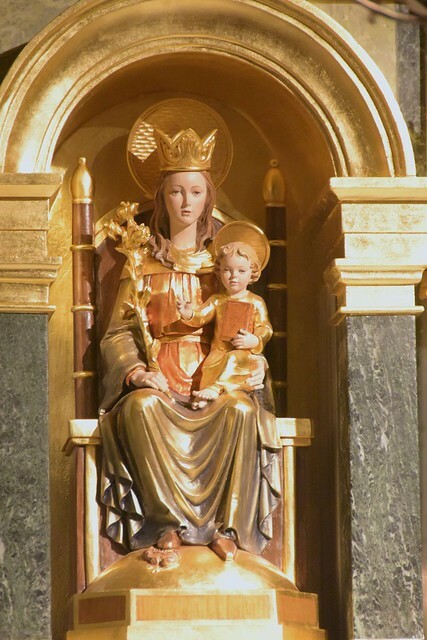 On Thursday 3rd September 2015, Bishop Alan Hopes, the bishop of East Anglia, came to celebrate Mass and to bless the new statue of Our Lady of Walsingham, which was carved specially for the chapel by Stuflesser in Italy – the same studio that carved the statue of St. Anthony at the back of the church 100 years ago! We were delighted that, among a congregation of many well known Catholics, the Rector of the National Shrine of Our Lady, Monsignor John Armitage, was also present and preached to us the first homily to be heard in the newly restored Lady Chapel here at Corpus Christi. Also presiding were Bishop Robert Byrne, Auxiliary Bishop in Birmingham, and Bishop Michael Barber, Bishop of Oakland, California. With the parish come together after many months of waiting to see the restoration of the chapel come to fruition, it was a very memorable evening.